MANILA, (PNA) – Philippine Navy (PN) spokesperson Lt. Cmdr. 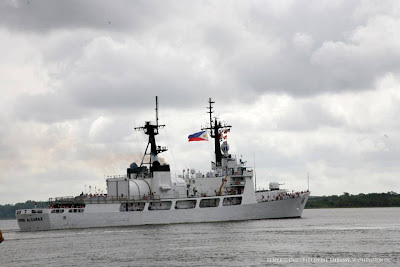 Gregory Fabic on Wednesday said that BRP Ramon Alcaraz (PF-16), the second Hamilton-class cutter in the country's service, was able to run up to 25 knots without experiencing any trouble in main propulsion system. This took place Tuesday (American time). The top speed of the Filipino warship is estimated at between 29 to 31 knots. The BRP Ramon Alcaraz uses a combined diesel and gas propulsion system. This consist of two Fairbanks-Morse 38TD8-1/8-12 12-cylinder diesel engines generating 7,000 horsepower (5,200 kW) and two Pratt & Whitney FT4A-6 gas turbines producing 36,000 horsepower. "The Hamilton cutter was able to run at 25 knots without any trouble. Everything was very satisfactory," Fabic added. He stated that the ship is now headed for San Diego, California passing through the Panama Canal. The Filipino warship left Charleston, South Carolina Monday (American time) for her voyage home to the Philippines.